All transactions are safe and secure with a reliable history in online purchasing behind each of our associates. 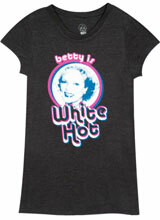 Buy the Betty White t-shirt to own Hot in Cleveland clothing and merchandise. If you loved Betty White's characters like sweet �n sassy Sue Ann Nivens on The Mary Tyler Moore Show, naíve airhead Rose Nylund on The Golden Girls or snobby Ellen Harper on Mama's Family then you must be thrilled that she has scored the role of Elka on Hot in Cleveland. She has proven she is down for any kind of role and that she can rock them all! If you wish she was a part of your group then snag this Betty White t-shirt. Keeping browsing our Hot in Cleveland tees for more great Elka options! In addition to the Betty White tee above, browse the Hot in Cleveland Clothing Gallery for more apparel like men's and women's clothes, kids shirts or hoodies.